The fiber of the ramie plant, an Asian millenary plant, has antifungal properties, better than those of any other material. It therefore avoids the growth of fungi, and provides you with a peeling action which is so soft that you can use it every day. 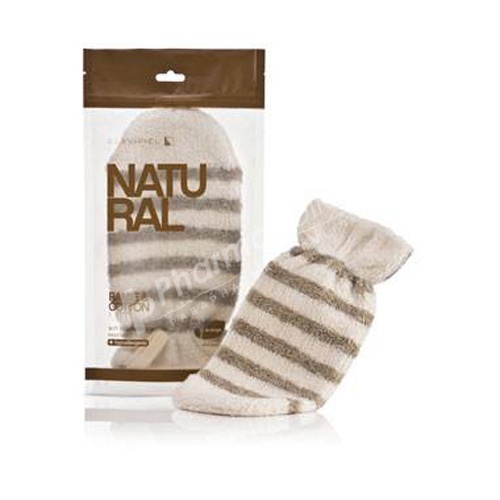 SUAVIPIEL’s ramie and cotton mitt always keeps your skin clean and healthy, without damaging it and without making it lose its natural balance. Nature uses infinite languages to transmit us that our body is beautiful and deserves to be taken care of. The freshest plants and the most delicate creatures from the deep sea whisper us a message that we sometimes manage to hear: keep calm. The Natural range of Suavipiel puts nature into contact with your skin so that it shines, being relaxed. So that all your body is healthy and calm. To make you feel good. Apply some drops of gel on the sponge surface, pressing it continuously for some seconds until getting abundant foam.